Last week, during the Jewish holiday of Rosh Hashanah, I posted the article "11 Questions About Rosh Hashanah and Yom Kippur You Were Too Embarrassed to Ask" on Facebook, mostly because it stated that graduates of Brandeis University make up half of Boston's Jewish population (guilty as charged). But the article prompted my high school friend Sarah* to ask me what I like best about the High Holidays, and the 10 day period between Rosh Hashanah and Yom Kippur. I started listing everything in my head, and realized it made a much better blog post than Facebook comment, because there's a lot to like. But it's also not that easy. 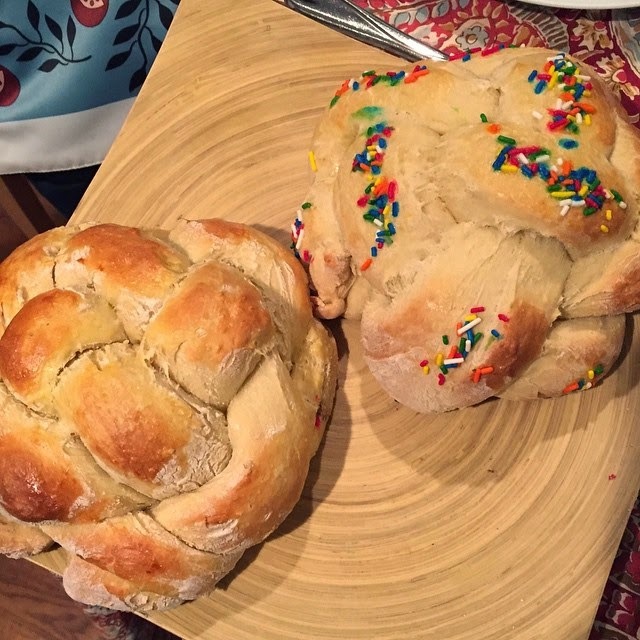 Woven round challah, to symbolize the new year. Sprinkles optional. I like going to services and hearing our rabbi's sermon evolve each year, as our daughters are close in age, and often she sheds light on a topic we have in common. I like that the ushers know that Marc and I can step in for pretty much any honor part in the service if the preassigned people don't make it on time. I like hearing the blast of the shofar for the first time each year, and seeing which shofar blower can last the longest. I like spending the days with family when we can. I like wishing my friends a "Shana tova," happy new year, and taking the extra minute to hug and kiss, which we don't bother with the rest of the year. I like buying new clothes to wear to synagogue, and the sweet and sour meatballs Marc makes for lunch on the first day of the holiday. I love round raisin challah. I like planning for our annual sukkah open house, which comes a week later. I like that parts of the holidays have become routine, and "what we do." I like that it's a little break from the world in the middle of the chaotic start to the school year. But that part right there? That's also the hardest part. Fitting in this extra layer of routine, even when we generally know what to expect, is really difficult. Planning for the days out of the office and school. Doing extra shopping and cleaning for holiday meals. Buying that special new clothing. The most challenging part, though, at least for me, is to get into the mental head space that these 10 days are meant to inspire. We are supposed to reflect on the past year, and ask forgiveness from anyone we might have hurt. We should be thinking about how we'll evolve and try to become a better person in the year ahead. We should be festive and celebratory, but also reflective. And that's really hard to do when you're rushing home from work, and your corneal ulcer still hasn't healed, and you're hungry because you're eating that fancy meal later than usual, and you have to convince your six year old to tuck in his shirt and wear his tight new dress shoes. And yet, it's worth it. Because of all those things above. Because I don't make time for much reflection the rest of the year, and so it doesn't hurt to make it a priority now. Because the work can wait. Because we don't hug and kiss our friends and family often enough. Because the shofar blast connects us back to our ancestors, to a long gone era. Because the quiet stillness experienced while listening to the shofar is like nothing else I experience all year. Much of life is the same over the 10 days. But it's also a lot sweeter and richer during those days, too. * By the way, that friend Sarah, who started all this? She just founded a firm called All in Stride Marketing. She's doing anything writing, editing, marketing, social media, e-newsletters and email marketing, and websites, etc., in Lexington, Kentucky. She has a strong background in the equine industry, but can help businesses outside of the horse industry as well. If you can use someone like Sarah, let me know and I'd be happy to connect you! I really enjoy hearing your thoughts on the holidays - thanks for sharing!